From the Kitchens of Bunny and Brandy: Cooking with Jackie Collins! Brandy has always been a big fan of literature. She often talks about how in her youth she had the inclination to become a novelist herself, though that desire seemed to have waned after a wild night with Hemmingway and F. Scott Fitzgerald (she won't say much about that evening other than that there was a race between a Model T and a bull involved). But her hunger for the written word never went away; no matter the genre, plot, or era, Brandy is sure to devour it. She simply reads everything from Tolstoy to Grisham, from twelve volume fantasy novels to the backs of cereal boxes. For years, one of her guilty pleasures has been the salacious stories of famed British author Jackie Collins, who has written almost thirty novels in the last 45 years. Never ashamed to flaunt her vices, Brandy happily boasts of her love for one of Collin's most prominent heroines, Lucky Santangelo. Featured in eight of Collin's novels, Lucky Santangelo is the definition of the modern, independent woman with her powerful presence, fierce sensibilities, and sassy attitude (it should be obvious by now why such a character would be appealing to Brandy). This is why Brandy was more than thrilled to learn that Jackie Collins was releasing a cookbook based on Lucky, aptly named The Lucky Santangelo Cookbook, which puts both Jackie's love of entertaining and Lucky's Italian-American heritage to use in a collection of cocktail, appetizer, entree, and dessert recipes perfect for everyone from the beginner cook to the well seasoned party planner. Pulling some strings, Brandy managed to get in contact with Jackie Collins herself to have a little chat about this exciting new venture. "I was sitting at my desk one day and I thought, 'I want to do something a little different than just write another book.' It came to me that [a cookbook] could be something I could give back to the fans," Jackie said of her inspiration for creating the cookbook, "It's a different kind of cookbook. So now, instead of getting a hardback book, which turns into a paperback book that goes back on your shelf, you can have something that goes in your kitchen and have fun with it." Stylistically, the book certainly is not your average culinary instructional tome. 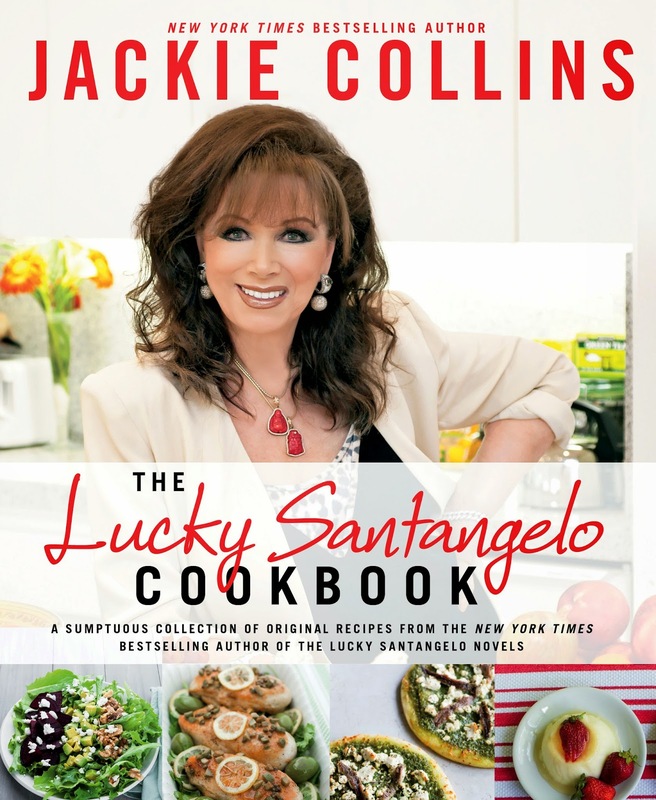 The book opens with pictures of Jackie and some of her celebrity friends (Michael Caine, Rod Stewart, and Hugh Jackman to name a few, and of course, Jackie's sister, actress Joan Collins), and then showcases not only beautiful photos of the food and easy to follow recipes, but also vibrant illustrations of Lucky herself. "I had so much fun styling the illustrations of Lucky. I would be on the phone to the illustrator [Michelle Beilner] and say to her, 'Ok, I want her to wear this dress and I want her to have these earrings, and black nail polish," said Jackie. There are also freshly written sidebar pieces throughout, which give a glimpse into Lucky's world of indulgence and intrigue. "I love the recipes, I'm so enamored with them," Jackie said when Brandy asked her about the goal behind writing the book, "They are dishes anybody can make. I didn't want them to be complicated, I wanted them to be simple because I love being in the kitchen and experimenting. I don't want to be searching out Japanese markets for some obscure ingredient nobody's ever heard of. That's the kind of cook I am. One thing about the Lucky Santangelo Cookbook is that it's for everyone. It's not full of recipes that you go, 'What the hell is that?!' It's also an indulgence. It's everything decadent and delicious. I am so fed up with these cookbooks that are full of non-gluten and vegan and this that and the other. I hate fake sugar and I hate fake butter. I wanted it all to be real ingredients, which are better for you in the long run. I mean, someone's just got to say to me, 'This is low fat,' and I think, 'I don't want that. Why waste my time?' [This cookbook] is not low fat, it's delicious, and we all deserve a treat once in a while." In Brandy's case, a treat at every meal seems more appropriate. Brandy couldn't help but ask Jackie about her favorite kinds of brunch indulgences. Noticing a recipe for a killer Bloody Mary in the book, Brandy asked Jackie if she prefers Bloody Marys or Mimosas with brunch. "I love mimosas. I absolutely love mimosas. I even love peach mimosas," Jackie said, proving herself to truly be a woman after Brandy's own heart, "I love sangria for brunch too. I love a cool sangria filled with cucumber and cut up fruit. I love using 7-Up in sangria because it really goes well with the red wine. 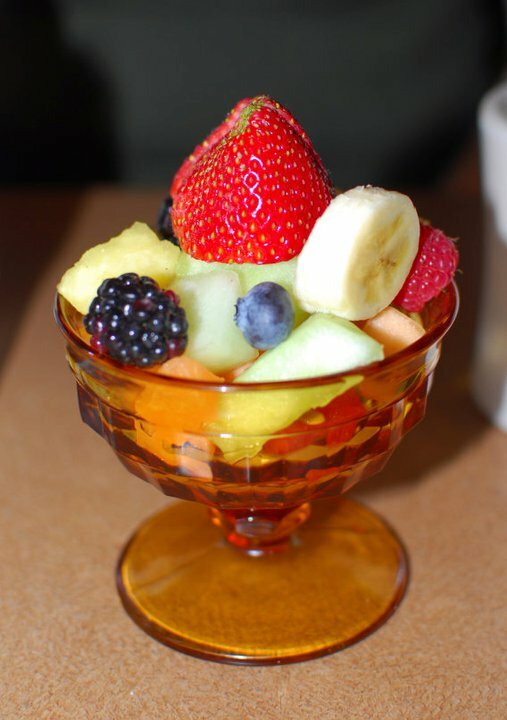 Tons of ice, tons of fruit, tons or cucumber and you've got yourself a fabulous afternoon. As I say, decadent and delicious." But the real question remained: what would Lucky have for brunch from the recipes in the book? "I think Lucky would like the Smoked Salmon Pizza with the Jackie Collins [cocktail] with lots of ice, of course, or maybe the Venus Bellini, which is also a fabulous drink. And then she would probably have the Cointreau and Peaches, which would be very decadent at lunchtime." Flipping through the book, Brandy found quite a few recipes that drew her interest. The Venus Bellini that Jackie had mentioned jumped out right away as a way to spruce up a traditional brunch drink with some fresh fruit purees. The Zucchini Boats, for example, with their sausage and spiced rice stuffing sounded like a nice fresh option for brunch, as well as the rich and succulent sounding Penne alla Vodka Martini with Bacon and Sausage. A side of crispy English Roasted Potatoes was certainly appealing to Brandy, as was the Butterscotch Pie, which had supposedly been inspired by the Midwestern grandmother of a friend of Jackie's. Brandy related her menu for a brunch made up of recipes from the book to Jackie, which she seemed to approved of, especially the potatoes. "If you're an Anglophile, you'll love the English Roast Potatoes. They are fabulous. People love them. One of the things I like to do before I put [the potatoes] in the hot oil is I like to sprinkle them with paprika and mixed herbs and that makes a whole different kind of deliciousness." That was enough to get Brandy's stomach rumbling, so she did indeed rush off to start whipping up some of Jackie's decadent delights. The Lucky Santangelo Cookbook is available now in stores and online in both the traditional hardback and e-reader editions, but luckily for our readers, Jackie herself has let us give you all a sneak peak at two of Brandy's favorite recipes from the book! The writers of this blog were provided with a copy of The Lucky Santangelo Cookbook for the purposed of writing this review. sugar has dissolved, 4 to 5 minutes. Set the sugar syrup aside to let cool. smooth. Strain into a medium bowl, cover with plastic wrap, and refrigerate. Clean the blender jar, add the strawberries and ¼ cup of the sugar syrup and purée until smooth. discard the strawberry seeds. Cover the bowl with plastic wrap and refrigerate. into two other small pitchers. twists and serve at once. simmer for 30 minutes, stirring every 5 to 10 minutes. minutes. Drain the sausages and cool them in a colander. more than 10 to 12 minutes to cook, so don’t add it to the boiling water until the final phase. Add the vodka, vermouth, and tomato paste to the tomato mixture. Simmer for 15 minutes. pepper flakes, if using. Serve garnished with the shaved curls of Parmigiano-Reggiano. the shaved curls of Parmigiano-Reggiano. Postcards from Bunny: What makes the Perfect Brunch? With the official brunching season upon us, Bunny and Brandy's expertise on the subject of brunching has been in high demand. Recently, Our Ladies were tapped by their friends at ProFlowers.com to explain exactly what they think makes for the perfect brunch, so they've come up with a short, but precise little list, explaining for any chefs (be they amature or professional) what they should take into consideration when planning the perfect spring or summer brunch feast. Coffee and tea are always options at brunch, but why waste the only meal that makes it acceptable to drink in the morning? Tradition dictates that there are two types of brunchers: Bloody Mary Divas and Mimosa Debutaunts. Brandy has always had a preference for the simplicity of the mimosa, especially when its done right with freshly squeezed orange juice, perfectly balanced by a splash of light, crisp champagne. Bunny, on the other hand, always liked the adventure inherent in a bloody mary, where one is never certain of the exact amount of spice until the first sip is taken, not to mention the over the top garnishes. But if there is one lesson Bunny and Brandy have learned over the last four years of brunch exploration, it is that there are actually so many more cocktails out there to be had for brunch with an infinite amount of ingredients and creativity to ignite the meal. For springtime, Brandy recommends something refreshing and floral, like a St. Germaine cocktail, or something with fresh strawberry puree. The best brunches are as decadent as they are intricate, so don't skimp on the amuse bouches and horderves just because its not dinner time. After all, you're supposed to be eating two meals at once here, so why only go for an entree? Bunny loves a good deviled egg as a brunch appetizer, or even a cool and crunchy salad. If it's a cooler day, Brandy adores a nice little bowl of creamy soup and a hunk of hearty, buttered bread. Always have two entrees for brunch. ALWAYS. That isn't to say you have to finish both entrees yourself, but make sure there are always two options to share at the very least: a sweet and a savory. Longtime readers of this blog will note that Bunny and Brandy often pair their favorite savory dishes (like Eggs Benedict or a sizzling steak skillet) with a sweet dish (like French toast or Pancakes). This practice enhances the experience of both dishes, providing a way to cleanse the palate of something that is either deliciously saccharin or sinfully rich so that every bite can remain exciting and fulfilling. When dining out, never discount the "Sides" portion of the menu. Though a good pan fried potato or stack of truffled French fries can be delightful, often you will find more exciting and varied options than the standard spuds, which can be substituted for zero or very little extra charge. Brandy has become a big fan of cheesy grits over the years and will often order a bowl to accompany her meals, while Bunny simply can't resit a freshly made biscuit with honey butter. When serving brunch at home, try something a little different by sauteing up some brussel sprouts with bacon or creating a fruit cup from whatever looked best at your local farmer's market. You might be surprised to learn that both Bunny and Brandy consider dessert to be optional for brunch, if only because of the "Two Entree" rule. Brunchers who have been following the guidelines correctly should already have had their sweet teeth satiated, but on the off chance there were no sweet entree options to be had, go ahead and order the most indulgent dessert on offer to make up for the loss. Sunlight and comfort are the only two essentials. Though dining outside can have its charm, Bunny and Brandy have always found that just sitting near a sunny window and people watching during their meal can be the most relaxing way to spend a weekend morning. As for table dressings, nothing elaborate is needed for such a casual meal, but a few flowers always help to brighten up even the cloudiest day. A simple daisy in a bud vase can do wonders for a tiny table in a corner, so just imagine what kind of warm feelings a room full of flowers can invoke. And there you have it, friends! Tell us in the comments below what you think makes for the perfect brunch! With the two biggest brunching holidays of the year fast approaching (Easter and Mother's Day), Brandy has been inundated lately with questions about her recommendations. "We want to go somewhere with top quality ingredients, but without the prices to match." "Is it better to go with a bigger group and just share a bunch of dishes?" "Buffet or a la carte?" "Sweet or savory?" "Cocktail bar or juice bar?" It has been an endless stream of inquiries for weeks. Though Brandy can't deny that she enjoys being looked upon as an expert in the subject ("I have credibility in very few areas of my life, but its nice to be recognized for an expertise in side potatoes and fruit cups," she has been known to say), she does find the indecisiveness of her admirers a bit triffling. "People just need to relax," she says, "The easiest way to pick a restaurant for brunch is to simply look at the menu on the web site and see if anything is appealing, then call to make a reservation. You're asking to be sorely disappointed if you show up somewhere you've never been before with every second cousin you have and expect to be seated right away on Easter morning." The one thing she will advise, however, is that when dining with large groups, Brandy does prefer a buffet. "There's always something for everyone at a buffet," she says, "Classics and signature dishes, hot and cold, sweet and savory... a good buffet will anticipate the desires of the vast majority of its clientele and provide as such. And on holidays, it makes things a little smoother and quicker for everyone, especially those whose tummies have been grumbling all throughout church services." It came to Brandy's attention that Devon Seafood Grill in the heart of the Gold Coast had recently launched a brunch buffet of their own, and in the name of research, a few weeks ago she decided to bring along one of her most treasured companions, Babka (world famous Polish super model) to test the waters for all her curious readers. The pair first entered what looked to be an empty, yet sunny bar area and were quickly escorted downstairs to a wider, more cozy dining area adjacent to the kitchen and a short walk from the buffet itself. Though it was a little dim in the dining area ("It's fine for me. Sunlight does horrible things to my skin," Babka drawled as she removed her $400 sunglasses), Brandy felt it was nicely decorated without being too flashy. Quickly, a server came over to introduce himself and offered to take their drink orders. The selection of teas, coffees, and cocktails was pretty tantalizing to say the least, so Brandy decided to go with a coffee cocktail called The Butternut, which combined Frangelico, butterscotch liquor, and brandy (the liquor, not the person). Babka chose the Bellini, which was made in a pretty traditional manor with peach schnapps and prosecco. The buffet itself had a great mix of old favorites and signature dishes, all with a good splash of some of the best seafood in Chicago. On the sweet side, there was beautiful scones and muffins, as well as made to order mini waffles with a selection of spreads and syrups. The cold items consisted of some fresh and easy salads, like a nicely dressed Caprese and a savory Greek pasta. On the hot table, there was some very hearty biscuits and gravy alongside staples like eggs, bacon, and sausage, as well as beautiful fresh crab meat stuffed mushrooms, a creamy chicken picatta, almond crusted tilapia, and Brandy's favorite dish of the day, lobster mac and cheese. On the higher end side there was the premier hot bar with a custom omelet station, fresh carved prime rib, and some absolutely succulent king crab legs with drawn butter. Devon’s seafood was also on full display (literally) with a cold bar showcasing freshly shucked oysters, sushi, shrimp cocktail, and some of the most beautiful sliced fish anyone is likely to see on offer anywhere. Smoked trout and salmon, seared Ahi tuna, and peppered mackerel were just a few of the fresh and luscious looking seafood selections, all accompanied by gourmet condiments like capers, pickled ginger, spicy mustard, and seaweed salad, all made freshly in house. "I simply adore high quality fish like this," Babka said as enthusiastically as she could (her managers had requested she refrain from moving her face too much to avoid marring her flawless skin). Lastly was Brandy's favorite part of any brunch buffet, the dessert table. Smartly, the chef had decided to go with lots of small, flavorful bites, knowing that diners would already be pretty much stuffed by the time they got to the end of their meals. Served in sweet little mugs were some rich and creamy treats like orange scented and chocolate panna cotta, which went perfectly with the selection of gem like little cookies. The chocolate truffle cake and moist carrot cake were there as well for those smart enough to save some room (like Brandy), and for those looking for a lighter bite (like Babka), there was the beautiful, but intense key lime tarts as well as juicy chocolate covered strawberries. Devon Seafood Grill is now offering brunch every Sunday, including Easter Sunday April 20th, from 10:00-3:00 with a very reasonable price tag of $45 a person (not including cocktails) or $16 for children 12 and under, which seemed to give Brandy an idea. "Babka, dear, you know some talented makeup artists, don't you?" Brandy asked her friend. "Yes, of course," Babka responded. "I've been hearing about all these so called 'Ewe Tibers' and what not who can do anything with makeup," Brandy asked, "Could one of them make me up to look like I'm under 12?" Babka, throwing care to the wind and allowing her face to crack into laughter, responded, "Brandy dear, my friends are makeup artists, not miracle workers!" The writers of this blog were invited by the restaurant to dine free of charge in exchange for an honest review. Koi or Dim Sum More, Please! It's funny how ritualized people get about their weekends. "I have to have a drink after work on Fridays," some say, while others proclaim, "I can't get out of bed until at least 10:00 on Saturdays or else the whole weekend feels off." Obviously, Brandy's routine must include a brunch of some sort, which is perhaps why she has forgotten over the years that so many others worship at a different alter every Sunday morning (that is to say, actually worshipping at an actual alter). She was reminded of this fact by a new friend she met recently in the grocery store (they were both reaching for the last bag of chestnuts), who goes by the name of Bernais Bamboo. Ms. Bamboo, it seems, is a Sunday school teacher at a local Unitarian church, where she cheerfully struggles through teaching the core moral lessons of every religion to her little flock of angels, which Brandy quickly found out after asking her to brunch. "Oh, Sundays are a sacred day for me," she responded, "That's my time to mold the little ones into law abiding and kind citizens of the world." "Yes, yes. What about a Saturday then? 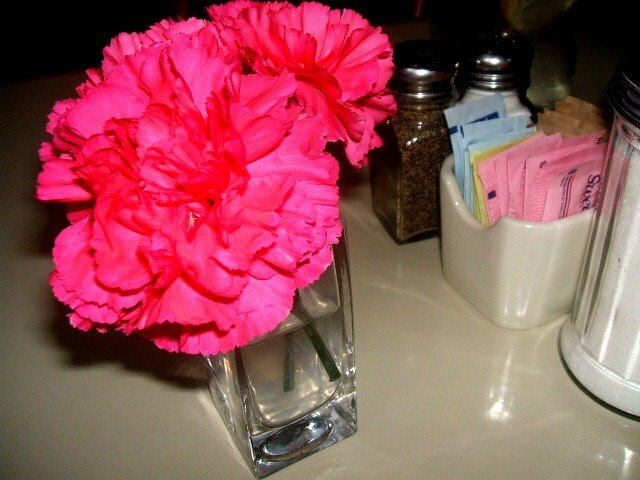 I suppose it wouldn't be a tragedy to brunch on a Saturday," Brandy sighed, which Bernais seemed agreeable to. Brandy chose to take Bernais to Koi in Evanston for a new kind of brunch experience. "They just started a dim sum style service here," Brandy explained, "Dim sum is a tradition in China and other Asian countries where families will stay at a restaurant for several hours, even all day in some cases, snacking on a variety of small dumplings and other dishes that are brought around on carts." "How lovely!" Bernais exclaimed. The inside of Koi was open and sunny with a soothing water wall off to one side as well as a cozy fireplace. Those combined with some of the metal and wood accents gave the place a very balanced, peaceful sort of feeling. A smiling waitress swept in right away to offer them some cocktails (a mimosa for Brandy and a Bloody Mary for Bernais) as well as pots of artisan tea (chamomile for Brandy and jasmine for Bernais). Then came the onslaught of offerings. Brandy and Bernais had been provided with helpful picture guided menus on their tables, but with over 60 options, it was hard to take everything in before servers began appearing with trays and carts full of beautiful little plates. Trying to keep up as numbers were rattled off (the servers would point at each dish and say something like, "I have #10, #16, #47, #48, and #49 here. "), Brandy and Bersain selected round after round of extraordinary one or two bite delights. Several things quickly jumped out as favorites among the bunch. First, there was the BBQ Pork Shou, a sort of baked hand pie, almost like what the English refer to as Cornish pasties, which had a transcendent, buttery, flakey crust, and a very sweet, almost dessert like filling of tender barbecued pork. Similarly, there was the BBQ Pork Bao, a steamed dumpling with a soft, bread like exterior. The Mango Shrimp Toast provided a lovely contrast in textures with its supple, melt away base of fried mango, and its topping of minced and spiced shrimp. The Edamame Dumpling, which was another steamed offering with a thin rice paper wrapper and a smooth bright green filling, made for a very nice sort of pallet cleansing interlude between richer bites. "It's so adorable!" Bernais squealed, referring to the edamame dumpling in her hand, "I just want to make a little face on it out of sesame seeds!" Brandy also really liked the Fried Tofu Skin, which had a more interesting crispness to it than the other fried options, with a clean and crisp mixed vegetable filling. The dishes seemed to alternate between the extremely flavorful, and those that were a little more simple. The Crystal Dumplings and the Shrimp Dumplings, both of which were steamed bites in rice paper wrappings, were a little bland without much spice or seasoning to them, as were the Shrimp Balls, a fried dish, which at least had the benefit of being interesting texturally. The table had been provided with a small helping of both chili oil and plum sauce, which did help to jazz up some of the less exciting offerings, but Brandy soon wished for a few more sauces to experiment with. "A little spicey mustard or sweet and sour sauce might have helped to break things up a bit," she remarked. The Beef Short Rib also proved to be one of the least favorites, if only because the flavorful and tender meat got lost in a bowl of mostly broth, bones, and fat. There were also several sweet options mixed in with the savory bites, which Brandy appreciated immensely. The Egg Tart, a simple custard in a neat little crust, was perhaps a little less sweet than imagined, reminding Brandy less of a creme brulee (as their server described it) and more of a particularly creamy quiche. The Sugar Cane Cake was a interesting experience in texture, as it had a very pleasing gelatinous and chewy mouthfeel, even if the flavor was just a very subtle sweetness. The absolute favorite for both Brandy and Bernais was the Coconut Bun, which almost resembled a pretzel, but was actually an unbelievably soft and pillowy steamed bread filled with the most luxurious coconut custard and topped with sesame seeds. "Oh my stars!" Bernais moaned after taking her first bite of the confection, "If there is anything to prove the existence of God, this might be it. I need to take a box of these to my Sunday school kids!" Brandy very much enjoyed her dim sum experience at Koi and could have happily stayed the entire day in order to try all 60 dishes on the menu if Bernais hadn't had to get home and plan her lesson for the following day. "But I am very glad to have done something a little out of my weekend routine!" she said cheerily, "In fact, I'd love to make dim sum part of my weekend routine from now on, if you'd like to join me." "Sadly, I cannot," Brandy sighed, "For I am held to another ritual, that of journeying forth, forever in search of the brunch-time adventures Chicago has in store." "Ok then," Bernais chirped, "Then I guess I won't have to share that coconut bun the next time I come here!" Bunny and Brandy have always been big supporters of up and comers in the field of culinary excellence, so one can imagine how thrilled they were to discover an event that happened in Chicago this past weekend which awarded scholarships to high school students looking to become all star chefs. 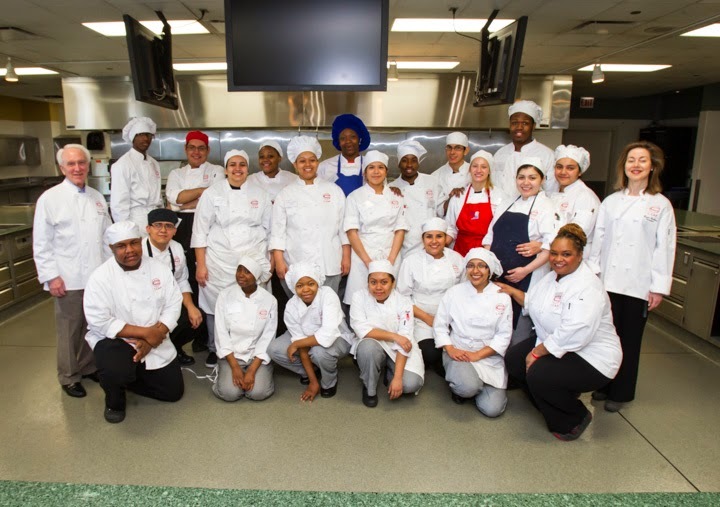 On Saturday, April 5, 2014, 20 finalists representing Chicago public high schools re-created the intensity of a four-star restaurant kitchen where they faced off in a savory and sweet challenge. Within a two-hour time limit, each competitor prepared, from memory, a two-course French meal: hunter’s chicken with tourné potatoes and dessert crepes with pastry cream and chocolate sauce. The competitors were chosen on the basis of their performance in the preliminary competition, academic records, a personal essay, and their desire to pursue post-secondary education and to forge careers in the food service industry. Students were competing for scholarship awards and opportunities including full- and partial-tuition scholarships to premier local culinary colleges and to some of the most prestigious culinary schools in the country. The ten schools represented included: Clemente, Dunbar, Gallery 37, Harper, Juarez, Prosser, Richards, Roosevelt, Simeon, and Washington. The results of the C-CAP Chicago Cooking Competition for Scholarships were announced to participants at the annual C-CAP Chicago Awards Breakfast yesterday, Monday, April 7, 2014 hosted at the Signature Room in Chicago. 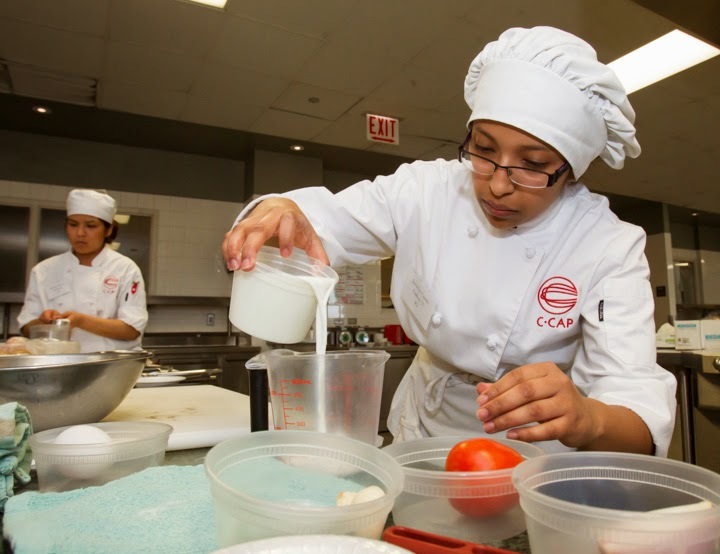 Careers through Culinary Arts Program (C-CAP) works with public schools across the country to prepare underserved high school students for college and career opportunities in the restaurant and hospitality industry. 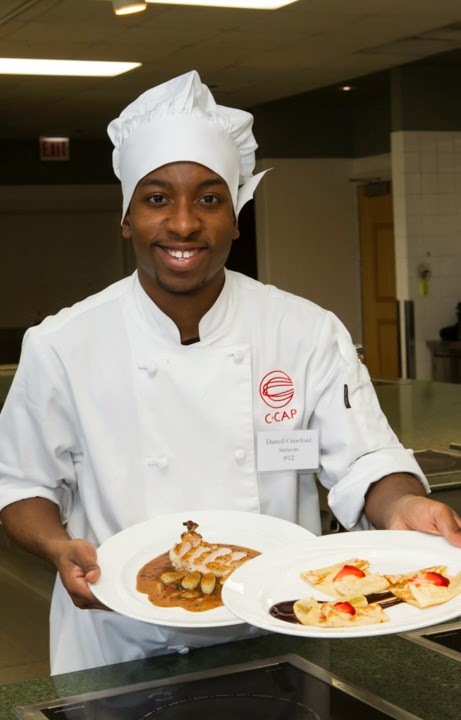 In the 2013-2014 academic year, C-CAP Chicago impacted the lives of approximately 2,500 students in 19 public schools working with 32 teachers in job training and internships, teacher trainings, college and career advising, product donations and culinary competitions that lead to culinary school scholarships. A national nonprofit founded in 1990 by well-known culinary educator and author, Richard Grausman, C-CAP manages the largest independent culinary scholarship program in the United States and since inception has awarded high school students more than $40 million in scholarships and donated more than $3.1 million worth of supplies and equipment to classrooms. Many C-CAP alumni, now graduates of top culinary schools, are working in leading restaurants and hotels throughout the nation. It's the time of year that every Chicago resident dreads: that awful guessing game that is the transition between winter and spring. Does one wear their rubber boots or brightly colored sneakers? Short skirt or furry leg warmers? Fashionable hat or functional hat? Brandy has been known to give up on trying to predict the weather altogether, siding instead for hunkering down inside her home until she can be absolutely certain what the temperature outside is. "I'll have no part of this back and forth business, thank you very much," she says, "If there's one thing I can't stand its indecisiveness. I won't tolerate it in people standing in line in front of me at the coffee shop, so I certainly won't stand for it in Mother Nature." Brandy's dear friend, Bailey Blue, who always tries to see the upside of every situation, decided to try and get Brandy out of the house one weekend morning, saying, "I know its a little unpredictable out there at the moment, but isn't that part of the adventure? You gotta take the good with the bad, the hot with the cold, and the sweet with the savory, as someone wise once told me." Brandy, who knew a manipulation tactic when she saw one, finally relented. "Alright, fine. What we need is somewhere that is both warm and cozy, yet light and fresh. That way, we're prepared for whatever the weather may throw at us." So it was decided to head to Eduardo's Enoteca, just off the Clark and Division Redline stop, Brandy hoping that the intimate atmosphere of a wine bar might provide just the sort of dichotomy she was looking for. Brandy and Bailey instantly adored the interior of Eduardo's. The slanted ceiling was done in warm, dark woods, giving the feeling of being inside of a giant wine cask, where as the stone tile floor suggested a Mediterranean patio. Brandy and Bailey were taken to a nice sunny table at the front of the restaurant, where they could truly appreciate the design. "Reminds me of my time in Napa," Brandy sighed, wistfully, "I spent many a night inside a wine barrel back then." "You mean inside a wine bar?" Bailey asked. Brandy did not respond. To start off with, Brandy went two fisted with a pair of very contrasting drinks: to quench her thirst for freshness, she ordered the Green Field, a mix of freshly juiced apples, spinach, cucumber, lemon, and ginger, and to quell the demon's lust for trouble, she ordered a Pearseco, a mix of Prosecco sparkling wine, cinnamon syrup, and pear nectar. The Green Fields juice had a lovely, smooth consistency to it, a perfectly balanced sweetness, and vibrant lemony zing that really refreshed and awakened the palate. The Pearseco was very light with a good hit of both the pear and cinnamon flavor, giving it a very unique flair and finish. "So which one do you like better?" asked Bailey, we had settled for a flavorful chai tea as her beverage. "They're both lovely in their own special ways, my dear," Brandy said between alternating sips, "One is good for the body, and one is good for the mind." "Which one is which?" Again, Brandy did not respond. They opened the meal by splitting an order of Apple Pancetta Pancakes, a combination that seemed a nice twist on the trendy habit of restaurants everywhere to add bacon to everything. The pancakes themselves were fluffy, but with some weight to them, and fairly massive in size. The toppings, which consisted of thin slices of green apples and small chunks of pancetta, had been caramelized to perfection. The apples still retained some of their tartness, which matched very well with the rich, crunchy, candy coated pieces of pancetta, reminding Brandy why the bacon trend was started in the first place. Bailey opted for the Smoked Salmon Board and a side of fresh seasonal fruit. The salmon came lovingly served on some olive oil brushed crostini and garnished with capers, tomatoes, red onion, and arugula. Bailey loved the freshness and delicacy of the salmon with its slight saltwater brininess and smokey finish, as well as the subtle pepperiness of the arugula and bite of the onion. She also really loved the touch of the olive oil on the crunchy crostini, which she said was a welcome change from the more expected addition of cream cheese. "It's much more light and fruity with the olive oil, I think," she mused, "But still very satisfying as a breakfast entree." Brandy went with one of the over baked omelets known as the Piedmont, which came filled with caramelized onions, mushrooms, and Taleggio cheese. Brandy found that the omelet had a very unique texture and look to it: the eggs were extremely light and airy, allowing the earthiness of the mushrooms, the sweetness of the onions, and the pungency of the cheese to really shine through in a nice, clean way. "I'm half tempted to pick the thing up and eat it like a taco," Brandy said, "But I think that might destroy its delicacy...and mine." The house potatoes that came on the side had a lovely crispy, fried exterior without being greasy at all, and small bits of onion helped to create a bit of variation in flavor from bite to bite. Lastly, Bailey and Brandy ordered a slice of the Tiramisu, which their cheerful waiter ("Suspiciously cheerful, if you ask me," Brandy had whispered, "No one should be that smiley this early in the morning.") informed them had been hand made by the owner's mother. The marscapone cream was thick and rich with a firmness almost more like a cheesecake than any tiramisu Brandy has ever had before. The pockets created by the lady fingers made for lovely bursts of intense coffee flavor, which only added to the richness of an already decadent dessert. All in all, Eduardo's Entoteca made for a nice little mix of the sinful and the saintly with their variety of light and fresh fair as well as their devilish delights, and with top notch service and a sweet, cozy atmosphere, it was hard to convince Brandy to go back out into the cold and rainy streets. "Look at it this way," Bailey said in a last attempt to get Brandy to rise from her seat, "With the way things have been, it could be 80 degrees outside right now for all you know!" Brandy was not convinced, nor amused, by this theory.